What do successful businesses survive on? A powerful combination of access to financial services and products; ease of doing business; strong support for SMEs and quality governance, as seen in New Zealand (74.2 points, 1st), Sweden (71.3, 2nd), Canada (70.9, 3rd), the United States (70.8, 4th) and Singapore (69.2, 5th), which took the top five spots on the Index. 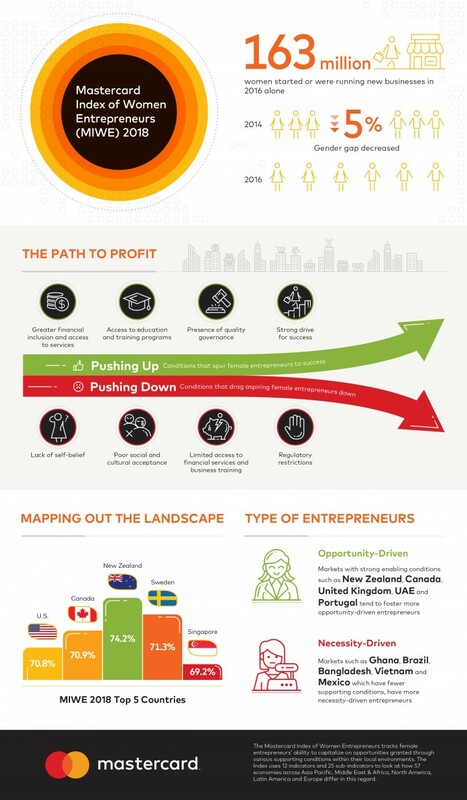 Entrepreneurship is seen as a ticket to opportunity for women, as shown in markets like Philippines (68.0, 9th), Botswana (66.5, 14th), Thailand (65.8, 15th), Poland (65.4, 19th) and Costa Rica (65.0, 20th). Although supporting conditions for entrepreneurs in these markets are not as conducive, they have a strong representation of female business leaders, professionals and technical workers, a vibrant local entrepreneurship landscape, and high regard for the status of successful entrepreneurs. Korea (53.2 to 57.2, 44th) tracked the biggest improvement in Index score, driven by a surge in entrepreneurial activities. The growth of the Korean female business landscape may have been fueled by positive perceptions of successful women executives and the set-up of a task force for gender parity. In fact, a lack of self-belief can be especially potent in deterring women from starting their own businesses. In markets like Belgium (25.5%, 22nd), Germany (25.3, 24th), and the United Kingdom (25.0, 27th) the percentage of female business ownership in the market is lower than expected, despite having efficient regulatory systems and high access to resources. However, a will always forges a way. In necessity-driven markets such as Indonesia (62.4, 30th), Ghana (61.5, 33rd), Brazil (61.1, 35th), Mexico (60.2, 38th), Uganda (57.6, 43rd) and Nigeria (56.4, 45th), women are as likely as men to engage in entrepreneurship. Such enterprises are likely to be in the informal sector, are less-technologically intensive, small in scale and assume the form of self-employment. Although markets in the Middle East and Africa region such as United Arab Emirates (49.5, 49th), Tunisia (45.2, 51st) and Saudi Arabia (39.3, 54th) may have tracked the some of the lowest scores in the Index, they also report the highest average growth expectations among women at 37%. Over half of women entrepreneurs in the UAE and Tunisia expect to hire 6 or more employees in the next 5 years. Women in Saudi Arabia are more likely than men to have these ambitions to grow their businesses.